No-Stirrup November is upon us! This month is an opportunity to strengthen yourself in the saddle, deepen your connection with your horse and achieve what you might have thought impossible. But that doesn’t mean that you need to go totally cold turkey, yank the stirrups off your saddle and attempt to continue on like nothing has changed — that can be a recipe for disaster both for yourself and your horse. This year, we’ve put together a guide to help you conquer No-Stirrup November in a way that’s safe for both horse and rider! 1. Get in a good warm-up — with your stirrups. In many parts of the country, November is getting pretty chilly. That can mean tight backs and stiff horses in some cases, and if you guess that a rider bouncing along without stirrups is pretty uncomfortable for a cold horse who isn’t warmed up yet, you’d be absolutely right. 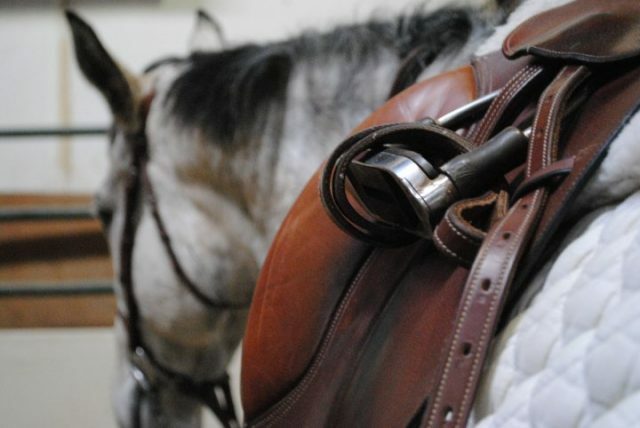 Keep those stirrups while you give your horse a good, thorough warm-up to ease his muscles (and yours) into working, especially if the air is getting frosty. You’ll both appreciate it. 2. Start small — yes, it still counts! “No-Stirrup November” doesn’t have to be taken literally. Especially if you don’t often do a lot of no-stirrup work in your regular program, suddenly removing the stirrups from your saddle and locking them away for a month has the potential to lead to some scary situations for you and a lot of bouncing on your horse’s back. You won’t be “cheating” — just setting yourself up for success to improve over the course of the month! Even cooling down after your ride without stirrups can be a stepping-stone to bigger things. Riffing off of the above theme of starting small, assess your current level of riding and set a realistic goal for the end of November. If you’ve never ridden without stirrups before, your goal might be to sit the trot for a full lap of the arena. If you already train without stirrups frequently, your goal might be to jump an entire 2′ course or perform an advanced maneuver without your stirrups. Having a workable goal to attain by the end of the month will help you build a program for the month of November: if you want to be able to canter without your stirrups, you can design steps that will help you get there. Without a specific end destination in mind, you might otherwise spend a lot of November aimlessly wandering without your stirrups wondering if you’re getting any stronger! 4. Work with a trainer or instructor. If you’re not sure if you’re ready to drop those stirrups, seek the advice of a trusted trainer or riding instructor, especially if you typically ride on your own. He or she can help you with no-stirrups exercises and drills to help you get stronger so you’re not just bouncing along on your own. If you ride a green horse or a horse otherwise unsuitable for extensive no-stirrup work, you may also benefit from taking a no-stirrups lesson on an instructor’s horse better suited to the task. 5. Take care of yourself between rides. Most equestrians know that riding alone isn’t typically enough to build the optimum level of fitness to become a competitive athlete — the best riders also train in the gym as well as in the arena. That said, if you’re already cross-training, you may need to scale back your activities in the gym to counter soreness from riding without stirrups if you’re not accustomed to the activity. Make sure you are supporting yourself with good nutrition this month, as well as stretching before and after your rides! If you had a particularly intense ride or lesson the day before, it’s definitely okay to scale back a bit the next day until you’ve recovered. There’s nothing worse than trying to hold on to the horse with exhausted legs when you feel yourself losing your balance! If you come into each no-stirrup ride stronger, stretched and balanced, your horse will also have an easier time performing with you. 6. Listen to your horse. If you notice that your horse is getting grumpy to saddle, reactive while grooming or otherwise shows signs of discomfort or pain, stop and listen to what he’s trying to tell you! Perhaps going without stirrups for a whole month is not in his best interests for the sake of his back or his soundness. There’s no need to sacrifice the health of your animal to follow a fad — but if you pay attention to your horse’s feedback and plan your program accordingly, there’s no telling how far No-Stirrup November might take you. No-Stirrup November can be one of the best months of the year to improve your riding for all levels of rider! Use the guidelines above to customize a program that works best for you and your horse and you’ll be amazed at how much you’ve improved. Tag your #NoStirrupNovember posts on social media! Keep an eye on EN’s sister site Horse Nation for support and stories, including a social media roundup each week during the month.